A good pair of wooden gymnastics or crossfit rings helps to keep your body in great shape. They are your perfect fitness training companion as they aid you in trying out highly flexible exercises. The flexibility that these rings offer is several notches higher than the conventional exercises that you try out at your gym. These gymnastic rings are affordable, fit for people of all genders and age groups and can be set up easily. You can carry it along with you wherever you go, thus ensuring that your busy lifestyle doesn’t stop you from working out. In this article, we are going to see a brief overview of the top 8 gymnastic rings on the market today. 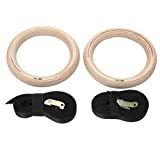 We have also provided our review on each of them so that it can help you when you set out to buy a pair of rings for yourself. 2 What to Look for in Gymnastics Rings? Note: Save time and check out our #1 recommendation – Nayoya Fitness Rings, awesome quality and affordable. As mentioned we’ve reviewed the top 8 market leading selections for your benefit so that you choose the option that suits your needs most. We’ll start by covering the top 4 below and you can then you’ll find a more detailed and comprehensive overview of the features, pros and cons down below. We don’t leave anything out, so you can get the most out of our editors’ top selections. If you feel there’s another option that should have been covered, feel free to comment below. Designed to strengthen your body’s core, tendons, and joints. In both the cases where the straps and clasps developed cracks, it was noticed that the users hadn’t followed the instructions in the manual. Nayoya Gymnastics Rings come with clear-cut instructions about inserting the buckle, with arrow indications. If you follow them to a T, your rings won’t break at all. Given its durability and ergonomic design, we feel it is the best product in this price range. It is not always you get heavy-duty, extra-wide wooden gymnastics rings at an affordable price. 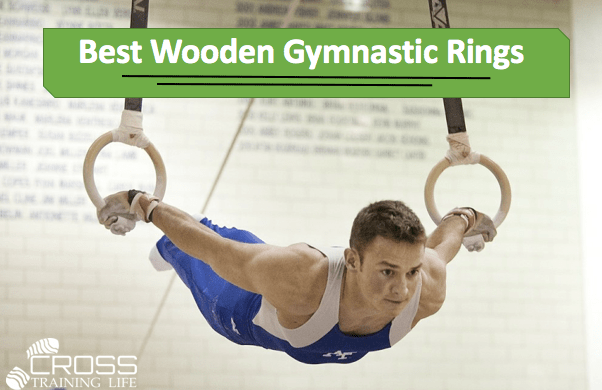 This 8” Diameter Wood Gymnastics Rings from Titan Fitness is an exception, indeed! In spite of a few cons, we would recommend this product for beginners, mainly because you can get extra comfort at a reasonable investment while working out. 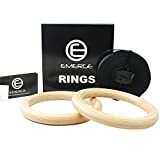 These premium gymnastics rings from Emerge are one of the best in the market because of their durability, flexibility, and portability. They come with 100% money-back guarantee; therefore, we strongly advise you to try these rings as you have got nothing to lose. We are sure you won’t regret your decision. The Power Gymnastics Rings from Evolutionize is one of those premium rings that give you the perfect grip and durability. Yes, there are problems of strap misalignment, which can cause a slight imbalance between the rings. However, we would recommend this product for two main reasons. Firstly, it comes with a lifetime guarantee. If you aren’t satisfied with the rings, Evolutionize is happy to replace the product or give you a 100% refund. Secondly, it is quite affordably priced. Hence, we would suggest you give it a go before you decide if you want to continue with it or not. 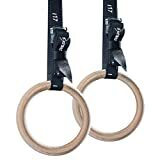 These high-quality wooden gymnastics rings from Evolv Fitness have managed to impress all fitness enthusiasts, irrespective of their level of expertise. It is affordably priced and comes with a 100% money back guarantee as well. Need we say more on why this product can be a great investment decision for you? Though most of the users had positive things to say about these rings, some of them pointed out that the buckles and the straps broke off within a few months of usage. However, you don’t have to worry because all you have to do is to contact the customer support team of Elite Sportz Equipment, who will then, replace the product or give you a 100% refund of your money, as per your convenience. While the Rep Wood Gymnastics Rings from Rep Fitness have great features and are affordably priced, we are not convinced about it fully because it comes only with a one-year warranty. There are other models in this price range that come with lifetime guarantee. Therefore, we would advise you to look for better options that provide you full value for your money. These wooden gymnastics rings seem to be of higher quality and efficiency than the sub-standard plastic rings. However, this reason alone is not convincing enough for us to recommend these rings for you. We have no information about the warranty and the price of these rings, which makes it difficult for us to assess it against its competitors. Hence, we would advise you to look for better and more transparent alternatives in your budget to get the best use of your rings. What to Look for in Gymnastics Rings? 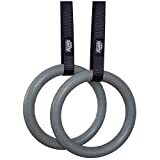 Are you looking to buy gymnastics or crossfit rings for yourself? With the number of brands and models available in the market, it can be a daunting challenge to choose one from the sea of options available to you. So, we have given you a few tips that you need to keep in mind when you set out to buy gymnastics rings. The Webbing – Choose the one that comes with nylon webbing so that it doesn’t break off when you use the rings for a long time. Also, nylon-webbed rings add more comfort to the rings as they don’t cause any irritation to your body. The Buckle – Choose rings that come with easily adjustable buckles or that have clamps so that the buckles can be adjusted to choose the height that you want, easily. The buckles need to be strong, and you must be able to set up the system in less than five minutes. The Rings – Always go for wooden or heavy duty polycarbonate plastic rings, as they give you the much-needed durability and versatility during your workouts. Wooden gymnastics rings help you in your workouts and overall body coordination. Hence, you need to choose the right ones to get maximum benefits from your physical fitness sessions. Read the reviews and choose those rings that have safe& solid construction and that are designed to give you full value for your money.